***Stop the Medical Execution of Mumia: ACT NOW! 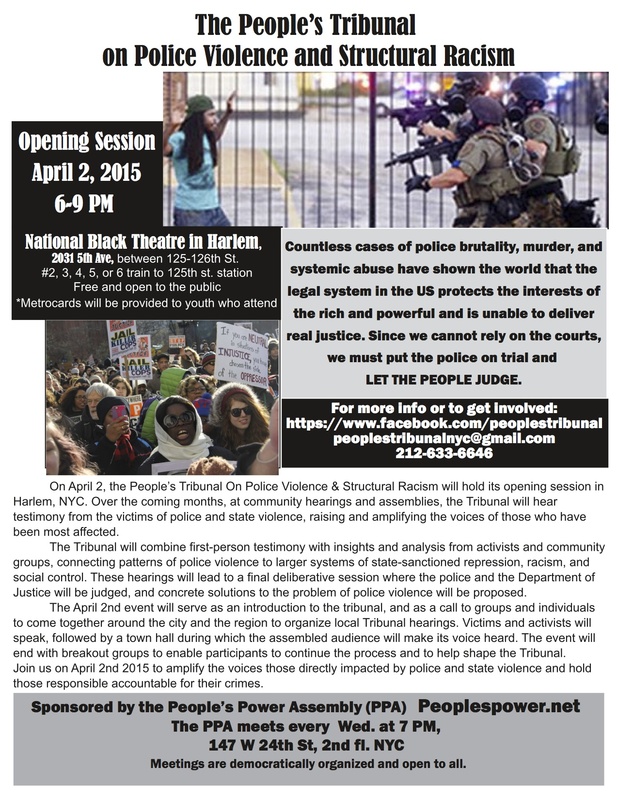 **Report from exciting & inspiring April 2, 2015 Peoples Tribunal. Youtube. We cannot rely on the courts for justice; we must form our own. The system refuses to hold the police accountable & stop them from terrorizing the people. It’s time for the people to put the system on trial! –BALTIMORE March 30: Water is a Human Right action; Stop Shutoff to 25,000; More info; FB Event. -DETROIT: Emergency People’s Assembly: Demand a moratorium (halt) on all tax foreclosures & evictions–Saturday, March 14, 2015; For details. Also FB Event. We will be planning direct action to save our communities! Demand a moratorium (halt) on all tax foreclosures and evictions. This is a State of Emergency! Under Michigan law, the Mayor, County Executive and Treasurer, and especially the Governor, have the authority to stop all foreclosures and water shut-offs to stop this disaster from taking place. 62,000 homes are scheduled for tax foreclosure on March 31, 2015. 37,000 are occupied homes.In the meantime, Lansing is sitting on $220 Million of Hardest Hit Homeowners funds, enough to pay all the delinquent property tax bills of occupied homes, stop the foreclosures, and provide funds to restore county and city services.Instead these funds are being given to Dan Gilbert to tear down homes, while the banks are completely left off the hook for the destruction they caused.